As I have mentioned in the PART III of this article, all the NS in the Internet will be aware of the IP of root servers. This information is provided in a file which comes along with the name server software package. The file is named.root or named.ca (it varies). This file is called the Root Hint file. It holds the name of the root servers and the corresponding IP at which it should be contacted. The root hint file is usually located in /var/named as named.ca or named.root (if the NS package is BIND). I have attached below a screen shot of a part of the file. Here you may see the name of the root server to the left hand side and its IP to it’s right. The list I have put here has the severs up to D only. This list continues till M ( M.ROOT-SERVERS.NET.) . The key file that makes root servers so special is ‘root.zone’. This is contained in all the root severs from A – M. You can download this file too and view it ! Just note the screen shot in the above page. 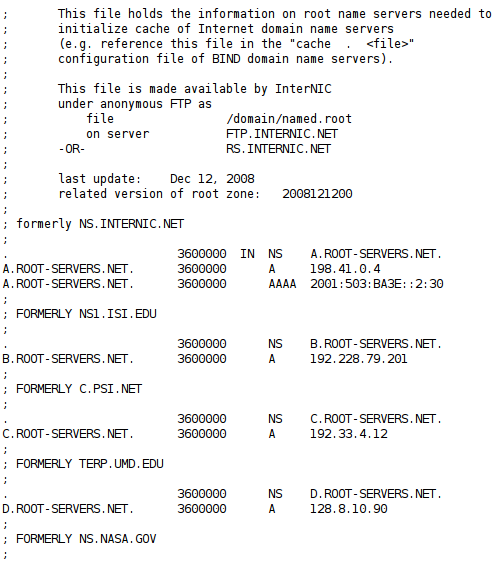 Two ftp servers are mentioned in the top : FTP.INTERNIC.NET & RS.INTERNIC.NET . Just do an ‘anonymous’ ftp to the above server and get the file by navigating to the specified directory. I have attached a screen shot of a part of it below. In the two screen shots, we can observe the name of the Authoritative NS for the gTLD ‘.com’ and ccTLD ‘.in’ . These Authoritative NS for ‘.com’ and ‘.in’ will have the IP of Authoritative NS for the domains ( second level or third level ) under it. 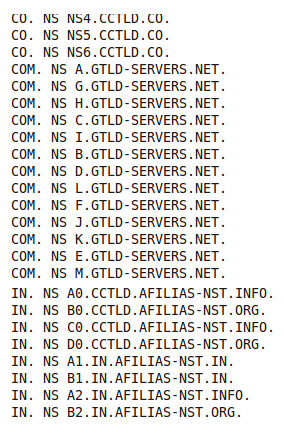 Similarly all the existing ccTLDs and gTLDs have an entry for their NS in this file. The above is an entry in the same file ( root.zone). A.GTLD-SERVERS.NET. is an Authoritative NS for .com TLD. It’s IPv4 and Ipv6 addresses are mentioned. Similarly, there will be an IP entry for all the all the authoritative name servers for all the TLDs. Please Note: I recommend the reader to compare the above informations with PART III of this article. It will help in clear understanding.